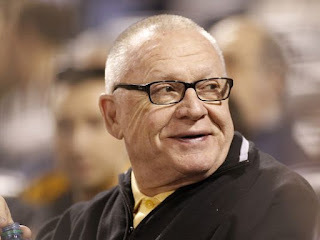 At tonight's NHL Awards in Las Vegas Jim Rutherford beat out Dallas Stars GM Jim Nill and Washington Capitals GM Brian MacLellan. In a final vote, Rutherford gathered more than enough points to nearly double his nearest competitor. From the start Rutherford had the ball rolling on his GM of the Year Award. Trading for Phil Kessel and Nick Bonino in the off season, all for the low cost of one regular roster player in Brandon Sutter. He also signed Eric Fehr and Matt Cullen in free agency. From there he turned around a floundering Penguins team by retooling mid-season. Adding Carl Hagelin for David Perron, Justin Schultz for a pick, and most impressively Trevor Daley for Rob Scuderi he injected speed in to a team that looked slow and dead. Further pulling the trigger on an in-season coaching change, one that amounted to him admitting his own mistake, was perhaps THE biggest lynch pin in the Penguins turn around. Without Mike Sullivan the 2015-16 Penguins are still stymied and stagnant, and who knows what their future becomes. None of these things happen without Jim Rutherford, a GM who was looked at as a stop gap when hired and was the subject of (perhaps understandable) criticism. In the end Rutherford showed them all wrong and as a result has a GM of the Year Award and, most importantly, a Stanley Cup.